Click HERE to read the sign. 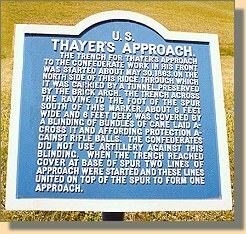 Commanded by Brigadier General John M. Thayer, the Union soldiers had twice unsuccessfully assaulted the Confederate works (at the top of the hill in the photograph above. After the second failure, the Union soldiers began digging a six foot deep trench up the hill. The men digging were protected from enemy fire by fascines used as a roof for the trench. 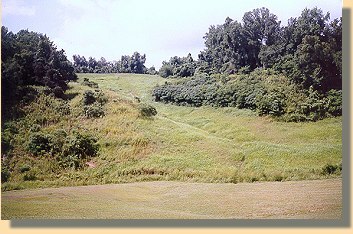 Near the top of the hill, the Union soldiers began digging a mine under the Confederates. Vicksburg surrendered before it could be completed. The terrain in this area made it hard for Brigadier General Thomas E. G. Ransom's artillery men to establish gun emplacements. 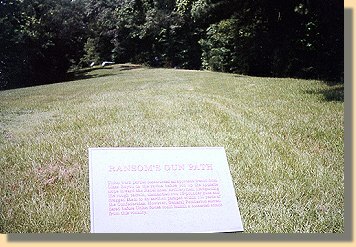 To move two of their 12 pounder cannon to support the infantry, the 2nd Illinois Light Artillery men dismantled the cannon and then, with the help of some of the infantry, dragged the guns, along the path in the photograph above, to a location near the Confederate trenches, where they were reassembled and placed into action.